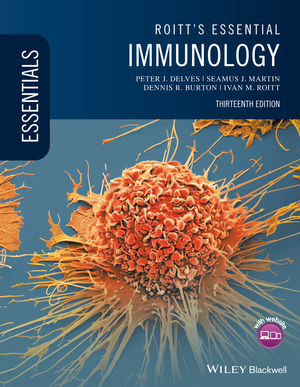 Roitt’s Essential Immunology clearly explains the key principles needed by medical and health sciences students, from the basis of immunity to clinical applications. A brand new introduction sets the scene to section 1, Fundamentals of Immunology, introducing the microbial world and the strategies the body employs to defend itself. Each chapter then guides the reader through a different part of the immune system, and explains the role of each cell or molecule individually, and then as a whole. Section 2, Applied Immunology, discusses what happens when things go wrong, and the role the immune system plays alongside the damaging effects of a disease, including cancer, immunodeficiency, allergies and transplantation and the beneficial effects of vaccines. A range of learning features, including introduction re-cap boxes, end of chapter and section summaries to aid revision, as well as further reading suggestions, and a glossary to explain the most important immunology terms.